Last year I had the pleasure of reading Blackhearts by Nicole Castroman, and I really enjoyed the story. There are seriously not enough pirate books in my life, and I can't quite seem to get enough of the ones that are! So, of course, I absolutely couldn't wait to read Blacksouls, the much anticipated sequel to Blackhearts. While the first book had really been a pre-pirate novel, this book HAS ALL THE PIRATES!! And that made me so, so happy. As I mentioned above, I'm a pretty big fan of pirate stories. Unfortunately, there are not nearly enough in my collection, so when I do have the chance to read one, I go in with pretty high expectations. 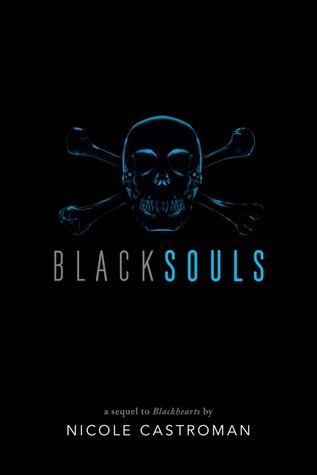 Blacksouls was awesome. There was definitely a lot more action and pirate-y content than what was in the first book. While there were some slow parts, there were also some that had me holding my breath at times when the suspense almost killed me. The setting for the book was completely different than the first as well. Nassau is a far different world from the England that Anne was so used to, and life in there was brutal. And I mean so brutal. It was definitely a different world than in the first book. The book ends in a way to where I assume that there will be a third book, but I couldn't find any information on it. I really hope that there is one, so I can continue along on this adventure with Anne, Teach and the rest of their crew!